To create a new task, click on “+ New Task.” You will need to give the task a name, and optionally set a status and choose an individual to assign the task to. Once you have completed these actions, your new task will be ready for you to edit and customize further. Click on a task's name text to open the details pane for that task, where you can view and edit all of the task's information. The details pane will stay open until you close it or open a different detail pane, so you can keep working even if you need to navigate to another part of TIMU to cross-reference information. At the top of the pane is the Task's name as well as a trail of breadcrumbs leading to the task's location. Next is a pair of dropdown menus for selecting the task's status and specifying who the task should be assigned to. Tasks that are assigned to you will show on your Activity page. Underneath the "Status" and "Assigned To" dropdown menus, you will see four icons, a check mark, a pair of speech bubbles, a padlock, and a clock. 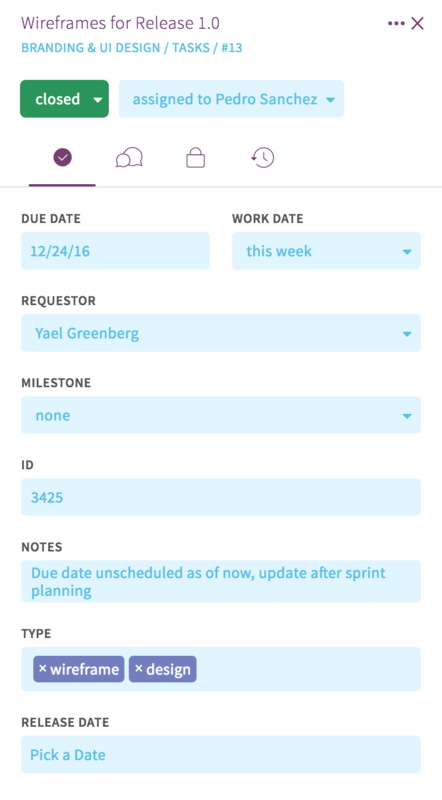 Click the check mark to view detailed information including the task's Due Date, Work Date, Requestor, Milestone, as well as the values of all the task's custom fields. 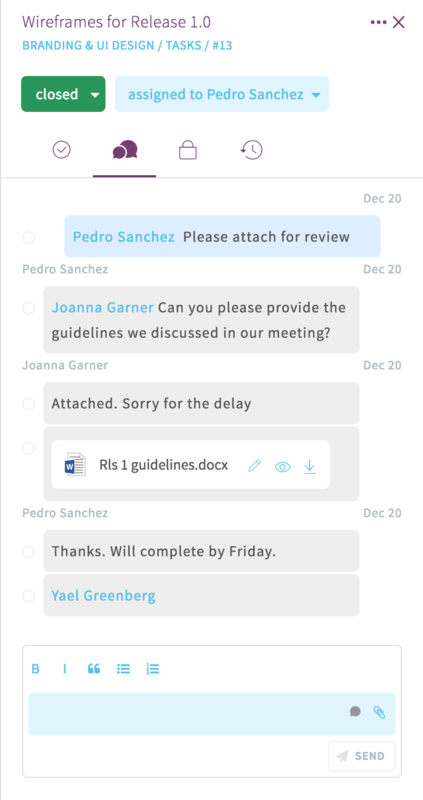 Click the speech bubbles to go to the task's discussion area, where you can communicate with your team and attach files related to the task. To get someone’s attention, type @ before the person’s name and select the correct individual from the dropdown. This person will then be notified that they have been mentioned in a task. Project Owners can use the padlock icon to access the task's security settings. For more information, check out our Security and Permissions Knowledge Base Article. Finally, the clock icon shows the task's complete history. Any changes to the task are recorded here and arranged by date. Favorite - this will add the task to your Favorites list for fast access from anywhere in TIMU. Mute - disables notifications for a task. You can Unmute a task if you want to start receiving notifications again. Rename - change the task's name. Archive - Hides the task from view. Use this when a task is no longer in use but you still want to view its contents on occasion. Archived items will show a "Delete" option on this menu. Deleting items is permanent, be careful!